Clearview is a company that can offer construction work and groundwork and provide a 'man & machine' service with a digger and operator or dumper and operator, for short or long term requirements for projects at domestic or commercial property. We cover Berkshire, North Hampshire and South Oxfordshire though do carry out larger projects outside these areas. 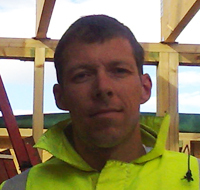 Owner John Barrett brings over 20 years experience within the industry in providing a wide number of building services whether you are looking for support for a new project or maintenance to an existing property. All Clearview staff are CSCS (Construction Skills Certificate Scheme) qualified and all operators of diggers or dumpers are CPCS (Construction Plant Competence Scheme) or NVQ qualified. We like to think of ourselves as a local company who cares, has the knowledge and qualities to offer the right solution providing quality work and customer satisfaction. Clearview have an environmental policy that aims to recycle as many materials as possible. If you are considering a building project, groundwork or have the need for internal or external maintenance please don't hesitate in giving us a call on 0118 9485112. We will be only too happy to visit and provide you with advice and a competitive quote. I have had the pleasure of dealing with John (Clearveiw) as a contractor for approximately the last year. He is always prompt with his quotes, which are always competitive and detailed. His work Quality, Ethics, Honesty & manner has always been professional. No job issued to Clearveiw has ever had a bad report and i would happily recommend his work to anyone. When needing a professional to redecorate our home, including preparation of a particularly pitted and uneven wall, John at Clearview was recommended to us. The job was carried out in a friendly and considerate manner and the finish was excellent. We would thoroughly recommend Clearview's services. At Clearview we often get asked whether we can help with 'just a small job' as well as requests with larger projects. Whether its a room redecoration or building a car park, we are confident that we can provide experienced staff to meet all your needs. Not only that, but we pride ourselves on completing a professional job, on time and at a cost that you can be assured will give value for money. We call it good 'old fashioned' pride in our work! Whether you are looking for Groundwork services, Property Building and Maintenance or our Digger & Dumper 'Man & Machine' hire, I look forward to hearing from you, carrying out a free site visit and providing you with a personalised quotation.